At Last, Regain Control of your Life! Ma’at Foundation Therapies provides you with a dependable, personal therapy formulated to help solve your problems, and to place you back in control of your thoughts and actions, thus allowing you to enjoy life to the full. The basic principle on how Reiki energy heals is very similar to how healing works in acupuncture. We know that every living being has energy within and around the body to be alive. This energy is called Chi [Vital Energy] and it is vital for the physical body to exist. Are you Right for TFT? Thought Field Therapy [TFT] is a new technique for the rapid relief of all kinds of emotional distresses. It works rather like accupuncture by stimulating the body’s energy meridians to resolve problems with regards to the body’s emotional control system. However, with TFT no needles are used. Instead, the patient taps on various parts of the body with their fingers. The results are frequently amazing as emotional problems often disappear in minutes. Ma’at Shop will be selling at the famous Natural November event this Sunday! All my metaphysical products will be on a special, “buy one, get one for half price” sale! This includes the Rods of Ma’at and the Alchemy plates, too. Thought Field Therapy [TFT] telephone sessions [lasting 15 minutes] for ONLY £10.00. Please contact Ernest Nelson-Homiah on 07939076033 or via email at ernest@maatfoundationtherapies.com to book your session. Attention, friends and all lovers of natural products! Another special deal: buy a Ma’at Gold EMF radiation blocking diode, and get one diode free. …and this is still not all! 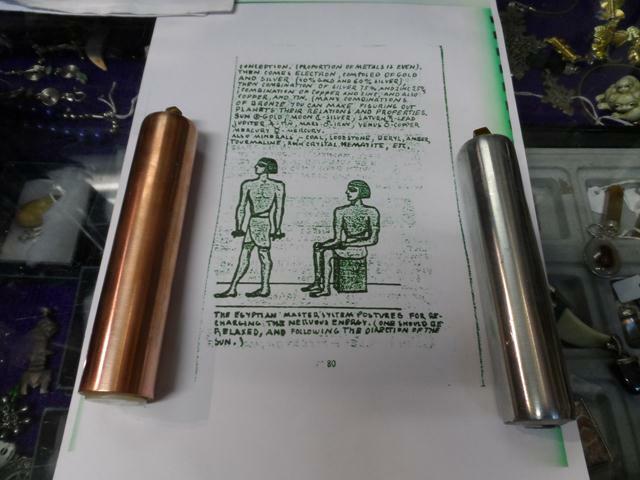 The first 20 costumers spending £10.00 at Ma’at Shop will be gifted with a Ma’at Gold EMF radiation blocking diode. See you on Natural Sunday! The material of each lamp is 250 million-year-old cave salt called Halite, which had been formed in the Himalaya mountains before any pollution could touch the Earth. Himalayan salt has a much higher purity level than sea salts (which are still safer than man-made, toxic ingredients-containing table salts), as sea salts are often contaminated by sewages, atomic testing remains and other bad chemicals from the sea water. The Halite salt contains over 70 minerals and it is highly recommended for cooking, bathing, and most health- and beauty care purposes. The Himalayan salt lamps’ heated salt crystals’ emit gentle heat and negatively-charged ions, thus benefitting their owners from many physical and mental health problems. Several salt lamps and other Halite products are now available in the Ma’at Shop! Well, I will only be at MBS, while moni and one other will be at festival of life in Holborn. Buy one and get on half price on Rods of ma’at, Alchemy plates, brain balancing program,orgone products, and cell phone radiation protection and last , is Himalayan salt lamp and range. The Ealing Summer Festival is on from 30th June until 19th August. This weekend is all about the Blues, and we invite you to come join us – look out for our stall at the Backstage. We are here today (Saturday 21st) and Sunday 22nd July and also at the Jazz Festival next weekend 28th & 29th July. If you haven’t yet tried out the Rods of Maat, now’s your chance! Experience for yourself the balancing effects of the rods on your energy system whilst relaxing in the park. We have a nice selection of remedies, jewellery, crystals and metaphysical items for you to choose. Remember, we also offer Thought Field Therapy and Reiki Tummo sessions which you can book at the stall. This weekend, Ma’at Foundation Therapies will be over at the Paradise Gardens Festival weekender with remedies, tools, jewellery, crystals, Rods of Ma’at and more – come down and join the fun! Part of the London 2012 Festival, this free event kicks off on Saturday 30th June 1pm – 11pm & Sunday 1st July 1pm til 6.30am. So, what is it all about? We’re starting with a bang! Spectacular pyrotechnic theatre, a great live music line up, epic street art, pop-up performances, curious sideshows, the Silly Olympics, a village fete, a Ballroom, a vintage funfair, a craft market and specialist food from around the world – this is no ordinary launch event. This is a FREE event! You don’t need a ticket, simply turn up from 1pm and join the party. Every atom, particle, and molecule is in constant vibration, and therefore has a frequency. The whole universe, including all living creatures is in a state of vibration or in other words made of sound. Sound is the first of our senses to develop and the last that leaves us when we die. In the womb we are constantly bathed in our mother’s body sounds like her heartbeat, respiration, digestion, voice, to list only a few. Every organ, cell, bone, tissue and liquid of the body, and also the electromagnetic fields which surround the body (aura), has a healthy vibratory frequency. If we are not resonating with some part of ourselves or our surroundings, we become dissonant and therefore unhealthy and “dis-ease” can manifest. This century, the Western world has rediscovered and scientifically proven what ancient cultures and tribes already knew for thousands of years; sounds and music can heal us and the planet. Since the dawn of time drums and their rhythms were the center of social and cultural activities all over the world. In Africa, the continent of human origin and roots of all music, the drum was the primary form of communication. Beside that the drums and their rhythms were used for socialization, entertainment, dancing and healing. Many mythologies speak about the drum as the shaman’s most important tool in healing rituals to induce a state of trance, which is the primarily key to eliminate any state of disease. Furthermore, the drum is the most accessible musical instrument. No other instrument gets people as immediately involved in a successful music making experience as the drum. Through the drum, all kinds of goals can be addressed, be they physical, cognitive or emotional. A variety of problems – including depression, stress, high blood pressure, addictions, asthma, migraines, Alzheimer’s disease, cancer, multiple sclerosis, Parkinson’s disease, stroke, paralysis, autism, Down Syndrome, William’s Syndrome and a range of physical disabilities – are currently treated with music and especially drumming. The brain can change from Beta waves (hard concentration and focused activity) to Alpha waves (calm and relaxed) to Theta (deep relaxation and visualization). During this process the logical left hemisphere of the brain is gradually switched off and the intuitive and creative right hemisphere is activated. The reason that rhythm and music is such a powerful tool is because it accesses the brain globally. Vision for instance is in one part of the brain, speech another, but music uses the whole brain. Follow up research from other sources showed that drumming, especially in groups, alters neuro endocrine and immunologic measurements in the participants. Cortisol level, normally increased under stress was down on all trials and blood pressure levels are reduced while drumming. Sound vibrations resonate through every cell in your body, allowing the energy centers to realign and to release negative cellular memories. Drums and their rhythms can align and balance mental, emotional and spiritual energy bodies, balance charkas and enable emotional blockages and imbalances to be shifted. This also has a profound effect on our consciousness, raising our vibrational level and enabling us to access spiritual dimensions. Through hitting the drum, unhealthy and toxic emotions can be released. The drum, then, becomes a tool of alchemy, altering that which is negative into something positive through an action as simple as a drum slap. As many healers have taught since the time of Pythagoras, when we move with the flow of life, we reduce stress and help our minds and bodies function as they are intended to. When we go against that flow, life becomes difficult and we suffer, first emotionally and later physically. Learning to feel the rhythm, pulse or groove while drumming can help us to actually experience that flow in ourselves and in others. Ultimately, to flow with the pulse, to be in groove activates our own natural desire for health, which is the most important step to achieving it. The drum provides us with an ancient form of communication, one that does not rely on the articulation of words, but one that uses a much more basic language, our emotions expressed through sound. When people communicate verbally, they are limited to one way communication (one person speaking and others listening), and there is great room for miscommunication and misinterpretation. The drum seems to have the capacity to unite all individuals who choose to experience it together and creates an experience of wholeness and community. Despite race, religion, color, creed, background, or ideology, all are joined together through this ancient instrument’s calling. The drum and its rhythms unlock some of the most positive qualities we have as human beings – the need to connect with others, the expression of our creative selves, the exhilaration of joy and play and the potential to heal. 1. John Diamond, M.D. The Way of the Pulse – Drumming with Spirit. Enhancement Books. Bloomingdale IL. US. 1999. 2. Mickey Hart. Planet Drum – A Celebration of Percussion and Rhythm. Harper Collins. New York. NY. US. 1991. 4. Alternative Therapies in Health and Medicine, Vol. 5, No 6, November 1999. The aura tells the story of each organ, cell or molecule for those you can read it. The mind and your emotion are one of the governing factors that determine the colours in the aura. The health aura and body receive energy from higher levels via energy vortexes, your chakras. In the body by transmitting energy to the inner layer of the aura- the etheric body’s health aura. This corrects the polarity of the entire three-body system. Egypt. Now you can also experience the balance harmonize and alignment of your mind body and spirit. Quite magical has happen to avis , a transformation, the goddess has awaken. Here are some health product that work , and made with top quality ingredient. I will be posting more information Asp.